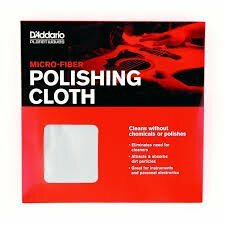 he Planet Waves Microfiber Polishing Cloth is made of 80% polyester and 20% nylon. One strand is 10 times finer than silk and 100 times smaller than a human hair. Microfiber is preferred for its very lightweight, super absorbency, and rapid drying properties. The polishing cloth rapidly absorbs up to 7 times its weight in moisture and can be used safely on any surface. Polishes your guitar to a brilliant shine.